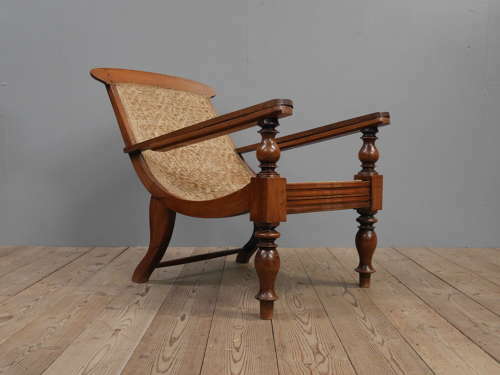 A wonderful, colonial planters / plantation chair. A beautiful & well loved planters chair of excellent form with beautifully turned legs, folding foot / leg rests & a woven seat. The joints on the arms are finished with basic brass work & the wood has developed a wonderful warm colour and soft sheen over the years, something not found in later examples. This delightful & unbelievably comfortable chair probably started life on a veranda in British India overlooking the plantations & now makes a fantastic & functional piece of furniture for the home. Wear commensurate with age, unrestored condition as pictured showing numerous pleasing signs of age. Both sides of the lower wooden frame have old age related cracks (neither really effects the chair & it still supports a very good weight but they could be stabilised further if the chair is to be used frequently or used to support a greater weight). The chair has numerous small chips bruises & imperfections as you'd expect & the leg rests are secure though I wouldn't recommend putting too much weight on them. Collection preferred, this also gives you a chance top check it out in person, UK courier service is also available, please enquire for details.